Nobody puts these grooms in the corner! 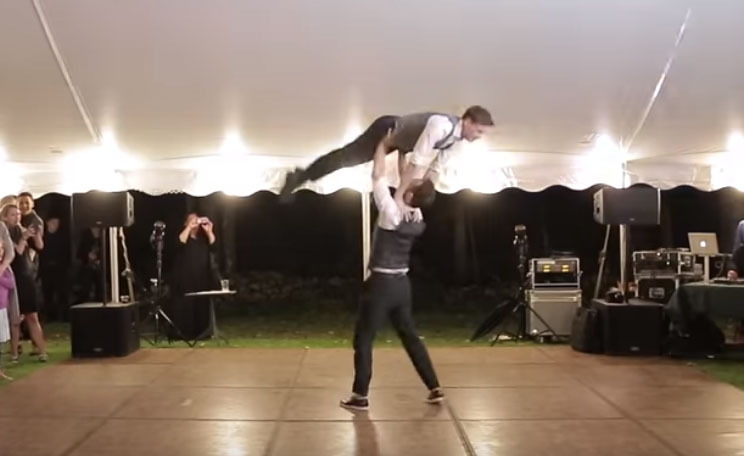 Noah Aberlin and PJ Simmons are going down in history for their epic wedding dance! It starts off typical enough, but then the music cuts out and you can hear members of the wedding sounding confused and upset. WATCH: Gwyneth Paltrow Shares Stunning Photos From Her Wedding: See Her Gorgeous Dress! The crowd is heard and seen going totally wild when the iconic lift is recreated at the end of the dance! People in the comment section also loved the over-the-top dance that has nearly 300K views on YouTube. “Y’all made me cry! LOVE THIS!,” one person wrote. “That. was. AMAZING. I had the geekiest smile on my face the whole time. Congrats to you both! !,” another commented. “Absolutely fabulous! Thank you for sharing this with us…Congrats to you both xoxo,” another gushed. What did you think about the dance?